Meat fondue pots require the ability to heat hot oil or broth. The heat source usually involves an alcohol burner or an electric pot to achieve the high temperatures needed. For handling oils and broths, the pot should be made of a metal, ideally stainless steel. Small sterno cans can be used as another alterntive to the alcohol burner, but keep in mind that the size and heat of the flame cannot be adjusted once it is lit. 1) Stainless steel pots are great and practical for fondue cooking and cleaning up after. 2) Strong handles on the side of the pot for easy handling. 3) Stable base that is not easily knocked over. 4) Adjustable alcohol burner with snuffer. 5) Metal forks with 2 prongs, long stem, and wooden handles are best. Avoid using forks with metal handles since they will get too hot to handle when using them with hot oil. Each fork should have a different color on the handle to help your guests identify who’s fork belongs to whom. Meat fondues need a very hot heat source. For meat fondue you want to heat your oil to a temperature of 350 degrees. For broth you want to simmer around 200 degrees. Ideally you will use an alcohol burner or electric fondue pot. The Swiss prefer a traditional alcohol burner used under a thick-bottom cast iron or stainless steel pot. For safety reasons the electric fondue pot has become very popular in America and seems to work just fine. Most burners are fueled with denatured alcohol or fondue fuel gel. Alcohol burners are the hottest tabletop heat source and ideal for heating oils that require high temperatures for cooking meats. The height and heat of the flame is determined by how much air you let into it’s chamber. Alcohol burners are meant to be used with fondue fuel (Sold at specialty food stores.) or denatured alcohol ONLY! (You can find it at any hardware store.) If using denatured alcohol, your burner will come with an insert that looks like a strainer. It goes inside the burner and keeps your flame under control while burning. If you are using the fondue fuel gel, you will not need the insert since the gel itself helps to control the rate at which it will burn. Fill your alcohol burner with 3 ounces of fuel. Using more is not recommended and may cause excessive flames. You can plan on 3 ounces of fuel burning approximately 60-90 minutes, depending on how high you set your flame. You can use 2 ounces of fuel if you plan on less time. Be careful to wipe off the edges of the burner if any alcohol spilled on them before you set it on its stand. Use a match to light the fuel at the center of the burner. Do not use a lighter since this can be very dangerous. Also, never tip the burner to ignite! You might cause fuel to leak and catch your table on fire! Once the fuel is lit, use the adjustable handle to control the size of the flame. Open more holes to make the flames higher. Close the holes to lower the flames. If your burner is running out of fuel, DO NOT attempt to add more fuel while the burner is lit. Use the burner cover to extinguish the flame completely and allow the burner to cool for a few minutes before re-fueling. TIP: No more than 4 people should sit at one pot. If too many forks are in the oil or broth at one time, the temperature can quickly drop and the meat may not cook properly. SAFETY: Be sure to protect your table from the heat of the flame by putting your pot on a stable surface with a heat pad, wooden cutting board, or ceramic tile under it. If cooking with an open flame intimates you, I recommend you try the electric fondue pot. It is safe, adjustable, and a great way to avoid any “complications” that can arise from using an alcohol burner. In Europe it is proper to serve guests with a glass of dry white wine or english tea and a few slices of prosciutto with white pepper to be nibbled on during the fondue party. Fondue is perfect for a relaxing and social evening with family and friends. The warmth of the flame, dipping in cheese, and drinking of wine sets the stage for a special evening. Set your table with a bright and earthly colored cloth and dishes with colors or patterns of flowers. A bouquet can also bring nature indoors and set the stage for a relaxing meal. Ideally, you will plan on having 2 to 4 people per pot. More than that will cause the cheese to be over stirred and the pot to be crowded with too many forks. Each person should have their own fondue fork and small saucer or plate. Have napkins available for each person. Give each person some wine or tea while eating along with some proscuitto if desired. (No water, as that would cause them to feel bloated.) Keep a pepper mill on the table with white pepper in it. Put your bread in a basket lined with cloth napkins. Serve your veggies on a plate for passing. The proper method for dipping your bread in cheese is to scrape the bread on the bottom of the pot in a slow zig zag or figure eight. The idea is that each person who dips should help to stir the pot a little and get the full flavor of the cheese. Once you lift your bread above the cheese, let the excess cheese drip a little back into the pot to prevent wasting cheese while allowing it to cool for a moment before eating. It is in very bad taste to double dip in the cheese or to put your mouth directly on your fondue fork. When eating your bread directly off the fork, just grab the bread with your teeth without touching the fork. Or, you can slide the bread off of your fork and onto your saucer and use a regular fork to stab and eat your bread. Some people like to establish some ground rules before serving fondue to make it more interesting. Here are some fun ideas you might want to try at your next fondue party. If anyone loses their bread in the cheese, they have to drink a shot of Kirsch. If someone forgets to stir the pot when they dip, they have to properly stir their next piece of bread and serve it to the person on their right. If someone puts their mouth on their fork, they have to kiss the person on their left. Another tradition: the “coupe d’midi”, or “shot in the middle”, for when you get full: a thimbleful of Kirsch, knocked straight back in the middle of the meal, usually magically produces more room if you’re feeling too full. Don’t ask us how this works…it just does. Once you have eaten most of the cheese, you will find a film of hardened cheese on the bottom called “la courte” or “la religuese”. Don’t throw it away! The Swiss consider it a treat to break it off the bottom and eat it with their guests once the pot is empty. Hey, don’t knock it until you try it! It reacts unkindly in your stomach with the cheese and will cause the bread to swell. Dry white wine or tea are the usual accompaniments. Do you have any tips to share? Post them here in our comment area. Also, if you plan to add a link to your own website, please be kind and post a link on your website back to ours! Thank you! The traditional cheese fondue recipe can be flavored with many different herbs or spices according to your own taste. Here are a few suggestions you might want to try. Onion – If you really like onion, try this! In a fry pan, saute 1/4 cup onions until they begin to carmelize. Lower your heat and add your wine and lemon mixture for 2 minutes. Strain out the onions and pour out your wine mixture into your fondue pot. Begin adding your cheese as usual. Or, add a pinch of onion powder to your mixture. Garlic – Use fresh garlic on the inside of your pot before adding your cheese, or add a pinch of powdered garlic to your cheese for added flavor. You can also add 1 diced clove of fresh garlic to your sauted onion and wine mixture then strain before transfering to your fondue pot. Italian spices and tomato paste – Mix in 1 teaspoon of italian spices with 3-4 tablespoons of tomate paste for a nice italian flavor. Try adding the onion and garlic mixture too! By the way, if you’re concerned about the alcohol in the kirschwasser don’t worry. It will boil off during the process of cooking the fondue. The purpose of the kirsch is both for flavoring and to make the fondue more digestible, which can be an issue when you’re eating something with so much cheese in it. Cheese fondue needs to be kept below the boiling point but above the melting point. It is best to warm the cheese fondue pot on a stove then transfer it to the tabletop heat source to keep it warm. As you slowly add your cheese mixture into the wine mixture, be sure to stir slowly in a zig zag pattern and prevent the cheese from boiling. You only need the pot hot enough to melt the cheese, not boil it. Once you have the cheese at the desired consistancy, transfer it to the table. Most cheese fondues should be served at 120 degrees to properly melt the cheese while preventing it from burning. Ideally you want to keep it warm on the lowest temperature possible to avoid scorching the cheese. Alcohol burners with fondue fuel gel is ideal for this purpose when using a thick based ceramic pot. You may also opt to use an electric pot or even a small crock pot set on a very low temperature. TIP: If pre-heating on a stove, a double broiler is a great way to prevent the cheese on the bottom from scorching. Is Your Cheese Too Thick, or Too Thin? If your cheese fondue gets too thick, increase the heat slightly and add a splash of dry white wine or a squeeze of lemon juice. If it is too thin, decrease your heat slightly and add more shredded cheese tossed with cornstarch to your mixture. Avoid adding water to thin your fondue since it changes the consistancy. Is Your Cheese Mixture Separating? The purpose of cornstarch is to keep the cheese in suspension and prevent the cheese and wine from seperating. If you see your cheese mixture separating, then add small amounts of cornstarch and stir. One of the most important factors in getting a smooth cheese fondue is the quality of your cheese. Processed cheese will be unstable and inconsistant. Be sure to use a good Gruyere and Emmentaler cheese since they were made to melt properly. If you are still struggling with your cheese, here is a helpful tip. Be sure to keep your heat low and consistant. Sudden changes in temperature will cause the cheese to ball up or become stringy. When doubling or tripling your recipe there is not as much surface area to allow for evaporation of your liquids, so be careful not to double everything. For doubling try this: Multiply your wine by 2, then subtract 1/4 to 1/3. For triple, multiply your wine by 3, then subtract 1/3 to 1/2. You can always add more if needed. Before you use a new unglazed clay pot it needs to be seasoned with a mixture of milk and water cooked in it over medium heat for 10-15 minutes. A glazed ceramic or enameled cast iron pot can be used without seasoning it first. Real garlic is used with traditional cheese fondues to prep the pot and add flavor to the cheese. You will need to rub the inside of the pot thoroughly with a cut clove of garlic. Let the garlic sit until the inside of the pot becomes sticky to the touch before you add your cheese fondue. Use less or more depending on how much flavor you prefer. Cheese fondue pots are typically made of earthenware or ceramic. Earthenware or unglazed clay pots may need to be “seasoned” to break them in before use, but glazed ceramic pots do not need this done. If you are in Switzerland, only a wide-mouth earthenware clay pot or cast iron pot will do for cheese fondue. (Shown in picture) Because fondue was originally a peasants dish, fondue pots were not very fancy. They usually had a thick base with a wide open top to allow for better distribution of heat and easy access for dipping and stirring. But here in America, you will find hundreds of variations that will work fine if you can keep the heat low enough. 1) The pot should be thick on the bottom with a sturdy handle. 2) The stand should be sturdy and hold the pot securely. 3) Ideally, the heat source should be adjustable. 4) Forks should have 2 or 3 prongs with long stems and wooden handles for safe handling. Each handle should have a different color to identify who’s fork belongs to whom. Once the fuel is lit, use the adjustable handle to control the size of the flame. Open more holes to make the flames higher. Close the holes to lower the flames or snuff out the flame with the lid if it is out of control. If your burner is running out of fuel, DO NOT attempt to add more fuel while the burner is lit. Use the burner lid to extinguish the flame completely and allow the burner to cool for a few minutes before re-fueling. Sterno or canned fuel is an easy and convenient alternative heat source, but may not offer you the control you need for keeping the temperature low for cheese. If you do choose to use a canned fuel, be sure that your pot sits up high on the base above the flame to avoid scorching. Also note that canned fuel comes in many different forms and sizes. The smaller cans with gel seem to be the best option. If you are planning a small appetizer for two before your meal, then a tealight candle with mini ceramic cup should work great. Be careful to place it on top of a wooden cutting board or another safe surface to avoid burning your table or cloth. 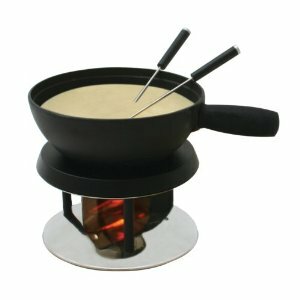 Today’s electric pots come in a huge variety and are great for controlling the temperature of your fondue beautifully. Although you can use a stainless steel electric set, for cheese I prefer using an earthenware or cast iron set as shown to the left. The thicker pot helps heat to distribute more evenly and keeps the cheese from scorching on the bottom. Great for traveling to parties with your favorite cheese fondue! Just set the temperature on low and your cheese will be perfect!